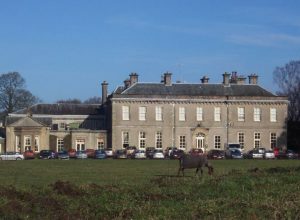 Burwell Hall, which was situated in Burwell Park, was built in 1760 for Matthew Lister. It was demolished in 1958, and only the stables remain. 1) (Burwell Park, co. Lincoln; the senior line of Lister, of co. York, of which was Sir Martin Lister, the celebrated physician, temp. Charles I.; the representative is, through the Dymokes, one of the co-heirs to the ancient barony of Kyme). Erm. on a fesse sa. three mullets or, quartering Bancroft, or, on a bend betw. six crosses crosslet az. three garbs of the field. Crest—A stag’s head erased ppr. 2) (Little Chester, co. Derby, and Manningham, co. York). As the preceding. 3) (Hirst Priory, co. Lincoln). Erm. on a fesse sa. three mullets or. Crest—A stag’s head issuing from a ducal coronet. Motto—Retinens vestigia famæ. 4) (impalement in Sarsdon Manor House, with the name; “R. BLOUT and E. LISTER” written over. Visit. Oxon, 1566). Az. on a cross betw. four doves ar. five torteaux, each charged with an estoile of the second, quartering gu. semée of crescents or, a lion ramp. ar., another coat of Lister. 5) (Gisburne, co. York; Baron Ribblesdale). (Armitage Park, co. Stafford; a branch of Listes, of Gisburne). Erm. on a fesse sa. three mullets or. Crest—A stag’s head erased per fesse ppr. and gu. attired or, differenced with a crescent. Supporters—Dexter, a stag reguard. sa. attired and hoofed or, charged on the body with an eagle displ. of the last, gorged with a collar of SS. and portcullises gold; sinister, a bay horse, bridled, saddled, and supporting a staff ppr. headed or, with a banner vert, fringed, and charged with the letters Y. L. D. gold, meaning York Light Dragoons. Motto—Retinens vestigia famæ. 6) (New Windsor, co. Berks). Vert on a cross ar. five torteaux, each charged with a mullet or. 7) (cos. Derby and Westmorland, and Wydopp, co. York). Erm. on a fesse sa. three mullets or. Crest—A buck’s head erased ppr. 8) (Finchley, co. Middlesex, and co. Essex). Az. on a cross ar. five torteaux, each charged with a mullet or. 9) (London; granted 20 April, 1602). Erm. on a fesse cotised sa. three mullets or. Crest—A stag’s head erased per fesse ppr. and or, attired of the last. 10) (Rowton, co. Salop). Erm. on a fesse sa. three mullets ar. Crest—A buck’s head erased ppr. 11) (Shipden Hall, co. York; on the roof of Halifax church). (Scotland). Erm. on a fesse sa. three mullets ar. a canton gu. Crest—A stag’s head erased ppr. charged on the neck with a trefoil slipped gu. Motto—Justus propositi tenax. Motto—Moal mori quam foedari. 13) (Bart., of Park Crescent, co. Middlesex). Erm. on a fess invected sa. three mullets ar. in chief a caducens ppr. Crest—A stag’s head erased ppr. in front thereof three mullets fesswise ar. Motto—Malo mori quam foodari. This Anglo-Saxon is an occupational surname meaning “the litster”, which was a dyer. A dyer is a person who adds color (dyes) to textile products like yarn, fabric, and fabrics using various liquid solutions. This name has existed in Yorkshire, England for many centuries, and is still best represented there in terms of numbers. It derives from the Old English word lite or litte, meaning to dye. Another source gives an alternate origin theory: it was given to people who read aloud during some part of a church service. In Scotland, it can be an anglicized form of the Gaelic surname Mac an Fhleisdier, meaning “son of the arrow maker”. There was a rebellion in 1381 known as Lister’s Rebellion, as it was started by John Lister, or Littester, who was a dyer from Norwich. The word was also associated with a salmon spear in fishing, spelled as lyster in Danish) or lister in English. Regarding the geographical distribution of the surname is discussed by H.B. Guppy in his 1890 book, Homes of Family Names, where he states “The dyers are represented by the surnames of Dyer and Lister. 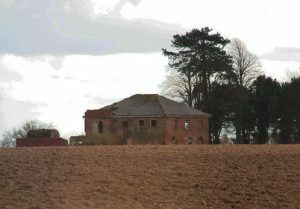 The Dyers are mostly confined to the three south-western counties of Somerset, Devon, and Cornwall, but they have also an independent home in Suffolk. The Listers are most numerous in Cambridgeshire and in the West Riding, and afterwards in Lincolnshire and Norfolk. When we come to consider the individual counties, we find that the following are particularly noted for their representatives of the cloth-trade: Cambridge for its Listers”. Another source states the term was originally used in East Anglia and other parts of northeastern England, areas that were settled by Scandinavians hundreds of years ago (the Old Norse word for dye is lita). 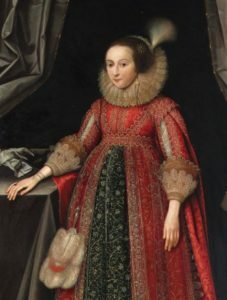 The surname became present in Ireland following the Cromwellian campaign of 1649 AD, and populated County Laois, called the “Queen’s County” by the English. Common spelling variants include Litster, Lyster, Lidster, Lestor, and Lidster. The related surname Lester means from Leicester, a place name, and Lister may be a corruption thereof. There is also a surname Glister, which may or may not be related (one source says it’s a derivative of Glaister, whereas another says it’s from Lister). Another surname List, may also be connected with Lister, and comes from the Old German personal names Lista or Listhar. It should be noted that this surname is contained within the Irish/Welsh name McAllister or McCallister, but it is believed those two names have entirely separate origins. Other last names containing the word are Hollister and Pallister. The earliest known person to bear this last name was Ralph Litster who was documented in the Court Rolls of the manor of Wakefield in 1286 AD. Hugh de Lister of count Notts who lived during the reign of King Edward I (1272-1307 AD) of England as documented in the Placita de Quo Warranto. Andrew le Litster was recorded in 1301 AD as documented in the Writs of Parliament. Joane Lyttesere was recorded during the reign of King Richard II (1377-1399) as documented in the Close Rolls. Cristiana Lyttester was listed in the Poll Tax of Yorkshire in 1379 AD. Robert le Lyster was recorded in the Preston Guild Rolls in 1397 AD. Nycholas le Lystere was documented in the Calendarium Rotuklorum Originalium. A one Aleyn le Littester (from Edinburgshire) was recorded as living in 1296 AD.Early marriages involving this surname include Thomas Lyster to Mary Pugborne in 1537 at St. Dionis Backchurch. The famous genealogist Bernard Burke’s book “Peerage and Knights” discusses three branches of the surname Lister: Lister of Burwell, Lister of Hirst Priory, and Lister of Shibden. The first branch, Lister of Burwell, begins with a discussion of Matthew Henry Lister, Esq. of Burwell Park in county Lincoln who was born in 1826. He had three daughters: Florence Holroyd Ribblesdale, Edith Violet, and Muriel. With his second wife, Katherine Ruth, daughter of Thomas John Manning, and niece of Frederick Nassau, he had two other children: Matthew Henry (1877) and Constance Margaret Douglas. Burke traces the lineage back to John Lister of Derby, who in 1312, married daughter and heir of John de Bolton, Bowbearer of Holland. From him descended in William Lister, Esq. of Midhope, who died in 1537 and left a son with his wife Elizabeth named Christopher. Christopher married, in 1521, Ellen, the daughter and co-heir of John Clayton, and had issue with her, including a son named William. William Lister was Esq. of Midhope and he purchased Thornton-in-Craven. He married Anne, daughter of Roger Midhope, and had a son with her named Lawrence. 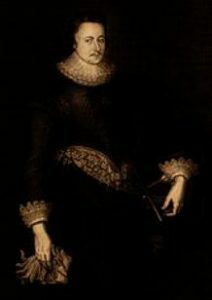 Lawrence lived in 1585 and married Evereld, daughter of Sir John Sayer, and he had a child named Sir William Lister, Knight of Thornton. William married Mary, daughter of Sir Henry Bellais, and died in 1650 leaving children. His sixth son was named Michael, of Frierhead-in-Craven, who married Mary Kebell. He died in 1610 but left a son: Sir Martin Lister, Knight of Thorpe in county Leicester, inherited Burwell from his uncle, Sir Mtthew. He first married Mary, daughter of Richard Lord Wenman of Tame, and has a daughter with her named Agnes and a son named Richard. His second wife was Susannah, daughter of Sir Alexander, and had a daughter with her named Frances, as well as Michael, Martin, Susanna, and Jane. He died in 1670 and was succeeded by his son Michael. Michael Lister, Esq. married Ann, widow of Thomas Peers, and left issue with her: Mathew, Elizabeth (who married Charles Knollys in 1689), Jane, and Mary (who married Thomas Beverley). 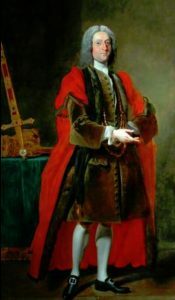 He died 1678 and was succeeded by his son, Sir William Lister, son of Laurence Lister. He was succeeded by Matthew Lister, Esq. of Burwell Park, who married Eleanor Dymoke in 1692 and has a son named Matthew Lister, baptized in 1683. Matthew in turn has a son named Matthew. This Matthew married Grace, the widow of Sir Edward Boughton, Bart., and they left a son named Matthew Dynmoke Lister. Matthew married Lydia, only daughter of Joseph Bancroft. He died in 1772, but he left a son named Matthew Bancroft Lister. Matthew claimed the Barony of Kyme and in 1799 me married Miss Sophia Bolton and left the following issue with her: Matthew Henry, John Samuel, Revered Joseph Martin, George Arthur, Alfred Edward, Lydia Boghton, Sophia, May, and Ellen Frances. He died in 1842 and was succeeded by the eldest son Matthew Henry. Matthew Henry married Arabella, the youngest daughter of John Cracroft, in 1832 and left four children with her: Matthew Henry (discussed at the beginning of this paragraph, his heir), Emily Sophia (who married John Deverell, a Reverned), Lucy, Florence Arabella, and Augusta Penelope Anne. This family bore arms blazoned as follows: Ermine, on a fess sable three mullets or, with a stag’s head erased proper as the crest. The second branch of the family, Lister of Hirst Priory, begins with mentioning George Spofforth, Esq. 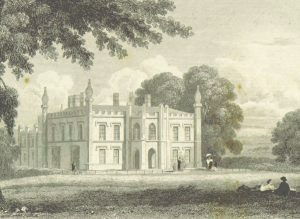 of Hirst Priory in county Lincoln and Finningley Park in county York. He was born in 1811 and married, in 1848, Caroline, the daughter of William Mostyn Owen of Woodhouse. Burke traces the lineage of this family back to George Stovin, Esq., who was the son of George Stovin of Tetles House. He took the arms and surname of Lister under the will of Thomas Lister of Girsby House. He married a woman named Elizabeth and has a son named James. 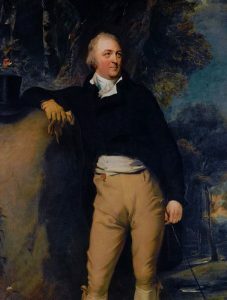 In 1800, James married Alice, the daughter of Robert Spofforth of Howden, and had four issue with her: George Stofforth, Robert Cornelius, Thomas Henry, and Alice (who married George Smith Hayter). This family bore Ermine, on a fess sable, three mullets or. The third branch, Lister of Shibden, begins with a mention of John Lister, Esq. 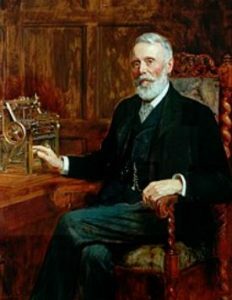 of Shibden in county York who was born in 1847 and was a Barrister of the Inner Temple. Burke traces the lineage of this line back to Richard Lister, who in 1439 AD, purchased property at Hipperholme in the parish of Halifax. 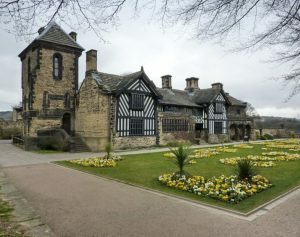 They came in possession of Shibden Hall in 1613. John Lister born in 1602, desceneds from this line. John Lister, J.P. succeeded Captain Jeremy Lister, and in 1844 he married Louisa Anne, daughter of Major Charles Grant, and had issue with her: John (mentioned above), Charles Edmond (1849), and Anne (1852). He passed away in August of 1867. The family’s lineage traces back to King Edward II, when John de Lister was documented as living in Derby, with the elder line being of Middop or Mydhop. Mark Antony Lower writes “In Lord Ribblesdale’s family the name is local, as the pedigree ascends to a John de Lister, who in C, Edward II was resident at Derby, and transferred himself to Yorkshire, on his marriage with the daughter and heiress of John de Bolton, bow-bearer of Bolland.” Gisburn Park, a noble mansion, that contains valuable artwork, belonged to the Lister family. The book “Genealogical Guide to the Early Settlers of America” discusses one person bearing this surname: Andrew Lester (also called Lister), of Gloucester, who was a freeman in 1643. He married a woman named Barbara and had issue with her: Daniel (1642), Andrew (1644), Mary (1647), and Ann (1651). He moved to New London and his wife died in 1654. He was remarried to a woman named Ann soon after and had issue with her as well: Timothy (1662), Joseph (1664), and Benamin. He died in 1699 and his wife married Nathaniel Millet. A one Thomas Lister came to Virginia from London aboard the Paule in July 1635. Mary Lister (who owned one slave) was recorded in the parish of St. Michael’s in the Barbados in 1680. The Lister family motto is: 1) Retinens vestigia famæ, meaning “Keeping in the footsteps of good report”, 2) Justus propositi tenax, meaning “Just and firm of purpose”, 3) Malo mori quam foedari, meaning “I would rather die than be disgraced”, and 4) Est modus, meaning “Everything in proportion”. Later people bearing this surname that bore the arms: 1) Lister to Nevile, John Pate, of Mears Ashby, co. Northampton ; Holbech and Chevet, CO. York, [1782}, 2) Lister, late Stovin, George, of Titley, Crowle and Girsby, co. Line, , 3) Lister, Baron Ribblesdale [26 Oct. 1797, Thomas Lister]. Supporters and escutcheon of pretence, , 4) Lister before Kaye, John (reputed father, L. Kaye, Bart. ), of Denby Grange, CO. York. Quarterly Coat, , 5) Lister to Marsden, of Gargrave, co. York, and Hornby Castle, co. Lane, , 6) Lister, Sir Joseph, Bart., of London, 1884,* Vol. LXII, fol. 184 ; Supporters (Baron Lister), 1897, and 7) Kaye after Lister, …. (reputed s. of Lister-Kaye, Bart. ), of Denby Grange, Quarterly Arms, . Famous people with this last name include: 1) Arthur Lister (1830-1908) who was a wine merchant and botanist known for his slime mold research, 2) Martin Lister (1639-1712) who was an English physician and naturalist, as well as a member of the Fellowship of the Royal Society, 3) Samuel Cunliffe Lister, 1st Baron Masham (1815-1906) was an inventor and industrialist from England, and 4) Philip Cunliffe-Lister, 1st Earl of Swinton (1884-1972) who was a well-known conservative politician in Britain during the first part of the twentieth century.